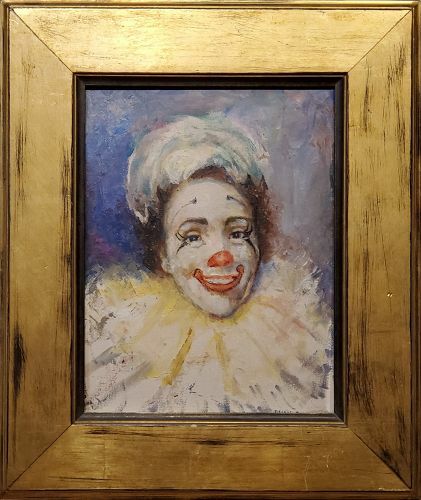 Oil on artist board, a bright and colorful sketch of a clown, 12" x 9" and signed lower right. Painted about 1935-40. Born in Pelican Rapids, Minnesota, Bessie Howard arrived in Boston at age 13 and spent most of her portrait painting career in that area. She studied at the Boston Museum School of Fine Arts and in Paris with Eben Comins, a portrait painter. During World War II, she worked in military hospitals, making pencil portraits for wounded service men to send to their families. She was not only a noted painter but was an expert in the restoration of antique paintings. She was a member of the Copley Society, Boston Art Club and the National Association of Pen Women. Source: Paul Sternberg, "Art by American Women"